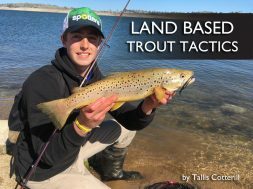 Selecting a productive trout fishing rod can be as easy as walking into your local tackle store and buying the combo that is on special for sixty dollars. This is the quickest, but not the best solution. 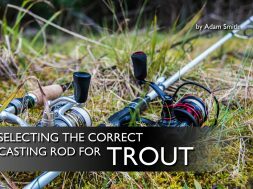 We can delve much deeper into selecting the correct rod which will increase your hook-up rate and land you more trout. 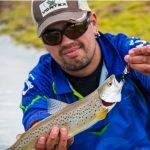 Factoring in the construction, action, length, weight and even reflective coating can positively affect the way you fish for trout. The composition of fishing rods have come a long way from its bamboo roots and are now generally only made from two materials: fibreglass and graphite. Graphite is the lightest and more sensitive of the two. The properties of a graphite rod far outweigh that of a fibreglass rod. 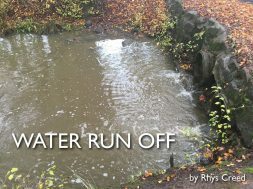 They are lighter, stronger and more sensitive which is very important for Trout fishing, but it will cost you more. In saying that, the extra few dollars you spend will be well and truly worth it. So in my opinion a graphite rod is a must when casting for Trout. Quality line guides are almost as important as the blank itself. 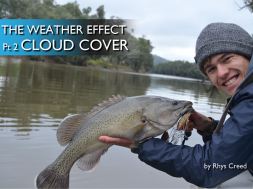 Line guides not only affect the rods ability to cast but also the feel of the rod when it is hit by a hungry fish. Micro rod guides are becoming more and more popular and it’s hard not to like the quality guides that the manufacturer ‘Fuji’ make and it’s a label I must see on a rod before I buy it. Grip handles should also be considered when looking for a rod to purchase. 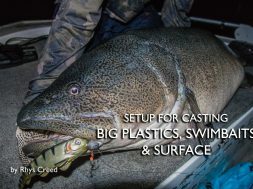 Whether you prefer cork or EVA foam you should pick it up and make a few false flicks to be sure it’s comfortable enough for those days you make a thousand casts. ‘Action’ is a term that describes where the rod bends and flexes when force is applied. The action balances the power of the rod for casting and also plays a role when fighting the fish. The rods action influences how the rod casts, the tips sensitivity and how the energy is transferred to the lure when you strike. A rods action is normally categorised into heavy, medium and light. 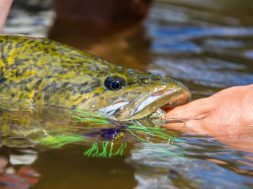 A lighter whippy action will cast lighter lures further and will be more forgiving when the trout you hook decides to become airborne as a lighter action rod can absorb the fish’s surges and has more travel to pick up any slack line when they leap from the water. Light is my preferred rod action. 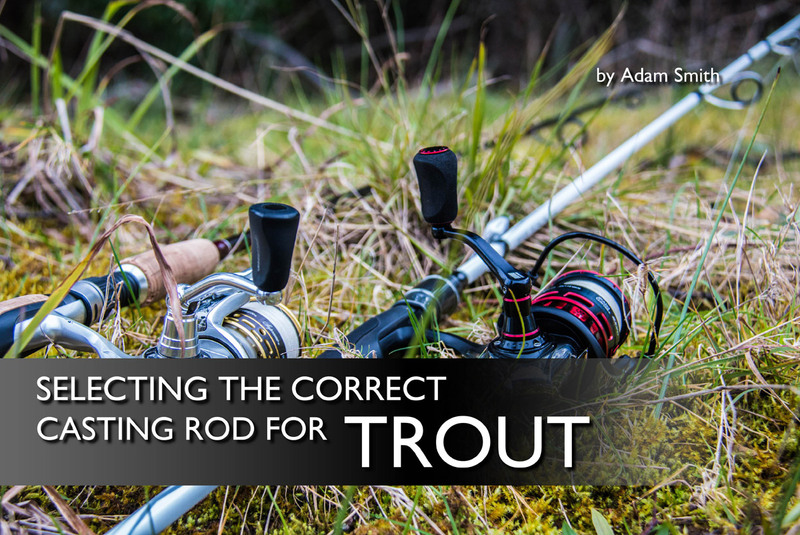 Rod lengths that suit Trout fishing normally range from 6 to 8 feet. 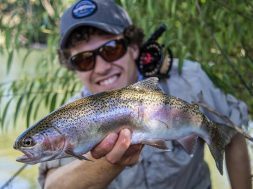 The length of rod all depends on where you are going to be fishing, whether it’s in the large open alpine streams or the lower overgrown creeks. When fishing an alpine creek which has little to no scrub to contend with I’ll tend to pick a longer rod which can cast further but is slightly less accurate. 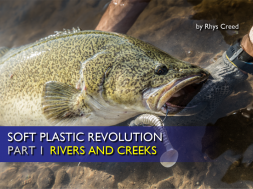 The longer the rod, the easier it is to control or play a fish that is hooked. In the lower streams that are scrubby and overgrown with blackberries I find a shorter, punchier and more accurate rod is invaluable. Anything between 6 and 6ft 10in will work well. 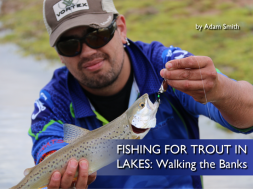 When it comes to selecting rod weight I’ll always recommend to go light, as Trout are a fun sports fish on light gear. 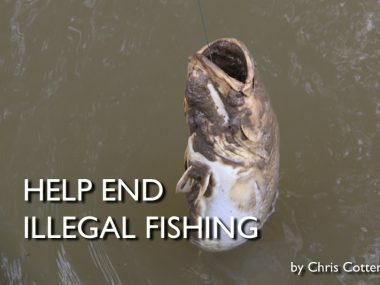 When they leap out of the water and use the flow of the stream against you it’s exciting, there is nothing more satisfying then angling the fish rather than skull dragging it into the net. 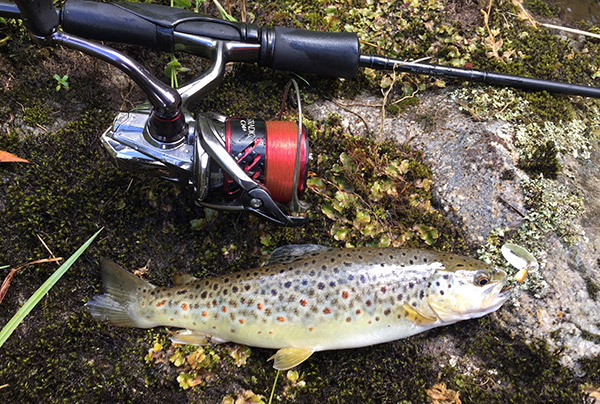 Anywhere in the 1-5kg range is a good place to start when targeting trout in streams. 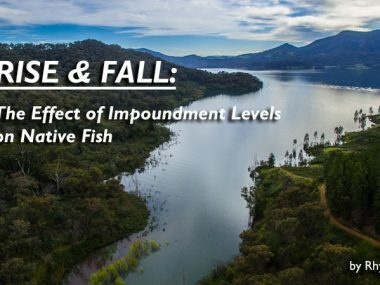 As for the best weight I’d recommend a 1-3kg rod which is more than adequate to toss around most trout lures (deep divers excluded). 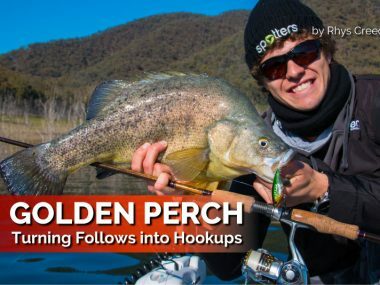 When casting deep divers stepping the rod weight up to a 2-4kg will be a necessity. Another useful tip is to match the casting weight of your rod to the lures weight you would mostly cast e.g. 4-10g. When fishing clear streams on a sunny day for trout that are easily spooked, some fly anglers have been known to sand off the clear reflective coating on their rather expensive fly rods in order to reduce the glare and not give away their presence to a feeding trout. Some spinning rod manufactures have taken note of this and offer rods with a matt finish rather than a high gloss and this is an important tick on my checklist when selecting a rod. 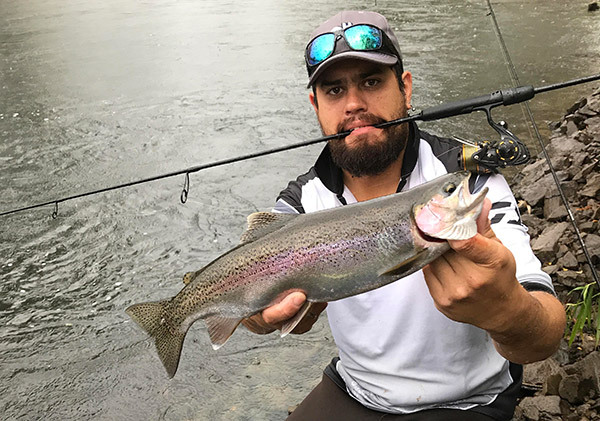 There are many factors that can improve your chances of hooking and landing a fish, putting the right rod in your hand can go a long way to doing this but ultimately we are all different and finding the perfect rod is an individual thing. 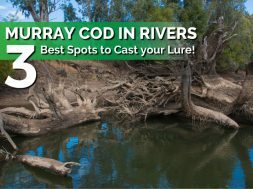 I can’t and wouldn’t recommend a specific rod for you to buy but I hope you will factor in some of the aforementioned pointers next time you’re looking at purchasing a new trout rod. Water Run Off – Do Fish Feed After Heavy Rains?